On Pikachu (58/102) has a red cheek. Corrected in future printings. View Here. On Kakuna (33/102 1st edition) length is printed twice taking the place of weight. Corrected in future printings. On Dugtrio underneath the weakness there is a first edition symbol instead of the grass symbol. Corrected in future printings. On Bulbasaur (44/102) length is printed twice taking the place of weight. Corrected in future printings. 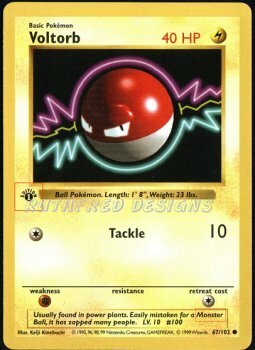 On Voltorb (1st edition) description says "monster" instead of "Poke". Corrected in future printings.View Here. On Machamp (1st edition) has "Seismic Toss" printed small and off-center. 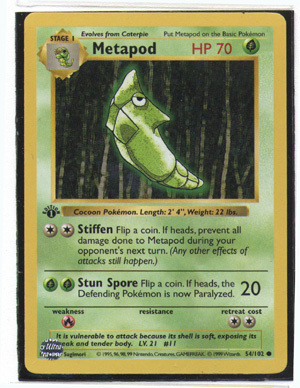 On Metapod (1st edition) hit points reads "HP70" instead of "70HP". Corrected in future printings. View Here. On Diglett (unlimited) energy cost for "Dig" turned 90 degrees counterclockwise.View Here. Some non-first edition cards were printed without shadows. Look like 1st edition without symbol. On Electrode (18/62 non-holo,first edition) the picture is the same as the base set. Corrected in future printings. 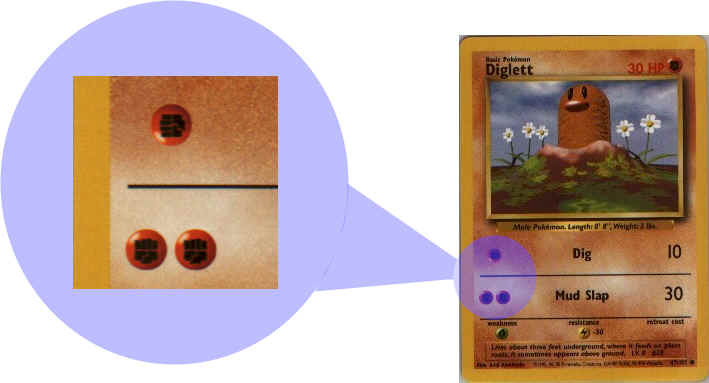 On Butterfree (33/62,first edition) lst edition symbol replaced with letter "d". 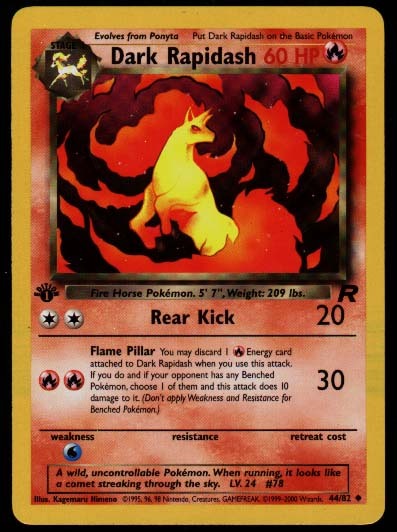 On Rapidash (first edition) card says "Put on Stage 1 Pokemon" instead of basic Pokemon. On Seaking (first edition) card says "Put on Stage 1 Pokemon" instead of basic Pokemon. A few Holo-foil cards of each Pokemon type are missing Jungle symbols. Estimated at 10,000 printed. On Zapdos (15/62 holo-foil) foil stamped like evolution card. Foil missing in upper left corner. On Dark Arbok ( 2/82 holo and 19/82 non-holo, first edition and unlimited), the copyright line says "�1999-23000 Wizards." It should say "�1999-2000 Wizards." Corrected in future printings. On Dark Rapidash (44/82, first edition and unlimited), the word "Length" is missing from the measurements. Corrected in future printings. View Here. On Dark Vileplume (30/82, non-holo only, first edition and unlimited versions), Fighting is listed as the Weakness; however, the correct Weakness should be Fire (as it is on Dark Vileplume 13/82 holo and on the Japanese version). Will not be corrected in future printings. Wizard of the Coast's states that they do not change card readings that would change game play, unless the card is unplayable as it stands. This card should be played as it is written except when explicitly stipulated otherwise for international tournament play. 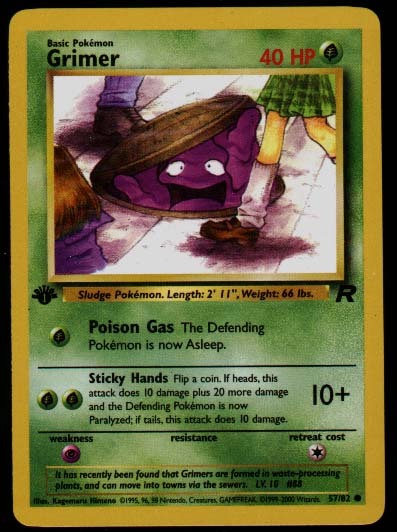 On Grimer (57/82, first edition and unlimited), in the attack Poison Gas, the effect was originally Poison in the Japanese version, not Asleep. Will not be corrected in future printings. Wizard of the Coast's policy states that they do not change card readings that would change game play, unless the card is unplayable as it stands. This card should be played as it is written except when explicitly stipulated otherwise for international tournament play. View Here. On Dark Dragonite, the holo card (5/82) was also printed as a non-holo card. This did not occur in the first edition and is already corrected for current printings. 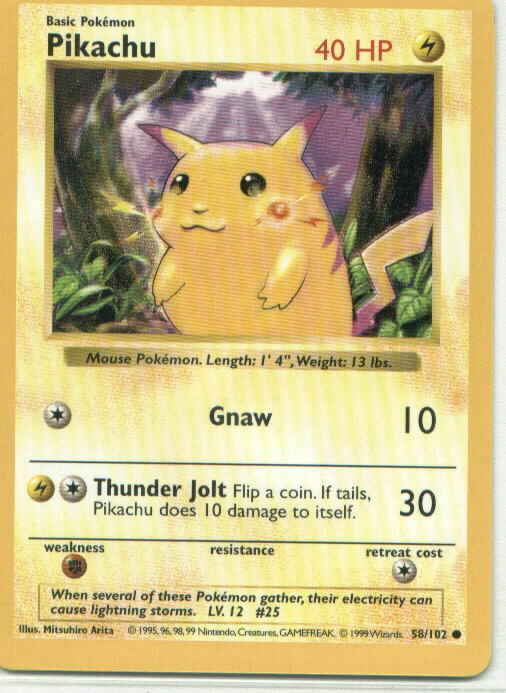 On Dark Raichu (83/82 holo, first edition and non - first edition), the reminder text says "Put Raichu on the Basic Pok�mon" but should read "Put Dark Raichu on the Basic Pok�mon." Any other errors? Then please tell me.